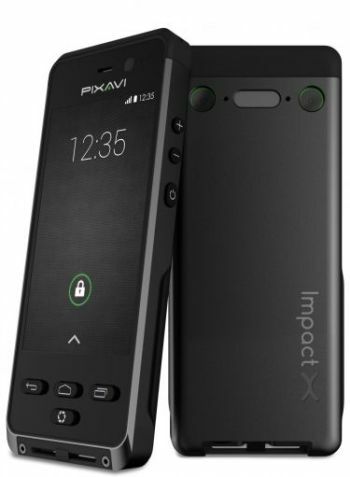 The BARTEC PIXAVI Impact X intrinsically safe smartphone has all functions of a regular smartphone, now with IECEx and ATEX Zone 1 certification. The device is perfect for working in hazardous conditions and is also explosion proof. This device is the next generation of wireless video communication from BARTEC PIXAVI. This smartphone is extremely powerful and has the most up to date processors and software, as well as ATEX and IECEx Zone 1 certification which makes it one of the most adaptable smartphones on the market. The Impact X has been designed so that battery lifetime, ruggedness, usability, sunlight readability, glove compatibility and camera performance are all up to a very high standard, even in those tough conditions. Together these specifications ensure that the device is perfect for imaging, documentation, inspection and many other tasks. Flipscape™: One-hand videography, anti-smudge recess for camera glass, anti-smudge coating on glass, dedicated camera button, glove compatible touch screen, moisture immune touch screen, ergonomic grip and hand strap makes it operational and ergonomic. Bartec have solved the problem of having to view a video from your phone on a narrow strip in the middle of a video window on YouTube, they have done this by adding a second camera on the back of the device that is rotated 90 degrees compared to the standard camera. The user is now able to stream live HD video to any location using the Sipido telepresence app. This allows for video conferencing in the field, making inspection and surveillance even easier than before. The modern processors allow the device to function at a high rate with its advanced technology, yet at a low level of power consumption. The Impact X has double the battery capacity of a normal smartphone (3000mAh) to ensure it won't let you down on the job.